When a Syndicate project begins, most often there is a 3rd party collaborator...whether that be an artist, pro skateboarder, store, or brand. Generally speaking, they will have a vision and bring that to the table. They will have an idea of what they want to skate, what materials to use, overall what they want their shoe to look like. It is the designer who is responsible for the end product...they most often visit the 3rd party on their own turf, hang out, hear about those visions, read between the lines a little bit, and ultimately work together to create a truly collaborative product that speaks from the soul of the concept. This is a somewhat magic process, never repeated the same way twice. If I may speculate and rant a little bit....But what about the internal projects in between those much hyped releases? The stories we may not necessarily know? Some of the least hyped models, the ones that sometimes slip through the cracks of blogs, those are often the ones that end up being the most popular and sought after longterm. From my point of view, when a designer is assigned a task and creates something from scratch, the inspiration and reason still comes from them, but it is much more about attracting a certain audience and creating a hit. It needs to be trending, and current… ahead, but not TOO ahead… So we start at a slightly different place than we do when we have a collaborative release….but where do we end up? The shoe is still created by an artist…we just don't always know their name. They have to answer to someone in-house who approves, and ultimately the consumer. For a larger line, such as Vans Classics, a dud may go by unnoticed and simply not be made, or get put on sale, or go to an outlet. But Syndicate has a different level of pressure. It is regarded and held to a higher standard. Each edition is poured over on message boards, blogs, etc, and scrutinized from every angle. In this modern age, shoes are leaked and deemed worthless 6 months before they even release. There is a focused audience to answer to. At an average of one project release per month within the Vans Syndicate line, nothing sneaks by enthusiasts. Somehow Vans Syndicate is able to take this in stride. They look to the past and create for the future. They are able to keep their finger on the pulse of their audience, with very few misses, if any, along the way. The following is a brief conversation with Neal Shoemaker, designer for Vans Syndicate. When creating an "S" edition at the beginning of an upcoming season, what is the initial thought process? (Is the shoe chosen initially at a meeting -- such as, we need a low top, how about an Authentic……we've released too many Old Skools this year, etc) We want to know about what liberties and restrictions you have. Usually projects start from casual conversation with Trevor, Rian, Nate, and myself (Syndicate's Product dept. ), what we think would be a fresh project or interesting story to tell. Everyone always has a list of people they want to meet / work with and who they think would be rad to highlight to a younger generation of shredders. Maybe we're thinking about things like "we need more low tops in spring / summer vs. fall / winter", but it's more about what we think will be the most interesting story, we don't really try to force certain styles in a particular season, that's sales' job. Nah, actually Syndicate is so small compared to the rest of the company that many times we are lucky enough to explore ideas a lot further than you'd think you'd be able too, it really gives the people we work with the ability to create exactly what they want regardless of the weather. Pictured above, I have 3 different sampled versions...The highlighted difference here being the heel pull, which has customers frothing at the mouth. How many samples do you generally go through before you get it right? How did you come about wanting to add the heel pull? I know that the W)taps Authentic 69 "S" was originally conceived and sampled with one, and it was removed…so can you elaborate on the thought process and reasoning of this feature for this release, and some of the other features in general? Well this might be a long one, so settle in. I'll have to start with the Jazz Stripe project from Fall 2012 to answer this. That season we made a conscious decision to focus on Syndicate a bit more, they wanted us to put out a few more projects a season and in turn they would dedicate a couple more resources to it. (I think they only run print ads in Sneeze magazine and maybe something else in a Japanese mag or two as well. There is some other stuff we've been discussing with sales / marketing that have yet to play out, so stay tuned for that.) Anywho, the initial thought behind the Jazz Stripe pack was to create a few sophisticated classics centered around the 35th anniversary of these classic Vans shoes. Old Skool and Sk8-Hi, it worked perfectly the shoes just hit 35 and they were the shoes the team guys and people around the building were asking for the most. So the idea was to put out a set of basic skateboarding shoes, all of them easy for anyone to wear, classic colorways with just enough of a twist (DRi-LEX® lining, all suede, garment leather jazz stripe, 80's label, better footbed, clean first foxing) to make them look different (better) than the Classics you could get at the Vans store. People in the building were fine with the concept because the Old Skool and Sk8-Hi are skateboarding shoes and they were the first shoes designed specifically for skateboarding back in 1977, so it all makes sense. So, with the feedback we had been getting on the Jazz Stripe stuff, I wanted to do the same thing to the Authentic, I love that shoe in the classic colors and they're great to skate in if you can find them in suede, but the canvas pairs usually blow out too quick. It was essentially the same approach as the Jazz Stripe's- We had Dill, Chima, Dan Lutheran and other team guys / friends asking us for Syndicate versions of the Authentic as well. This is where the first sample came in, but they were still too simple aside from all the slight changes: DRi-LEX® lining, PU footbed, leather binding, clean first foxing, light grey stitching, nickel eyelets; which got a poor reception in our line reviews, but with good reason. A pack of plain Authentics that don't look very much different than Classics except that they are all suede and more expensive? We had to change them, they looked too blah. So the second sample came about because I was working with Mike Hill the same season and the mint Authentics that Mike did were based on his skate shoes. 8 months out of the year Mike is wearing these gnarly green snow boots, he lives in what some might consider rural Ohio where boots are a necessity, but if he's skating he's been wearing these mint green, Made in the USA, Authentics that he's had for 20+ years that have that heel strip. (EDITORS NOTE: The Mike Hill project is featured HERE.) So when we got some of Mike's samples we decided to switch all the Syndicate Authentics to this original pattern, but it still wasn't enough of a change from the standard Classics. 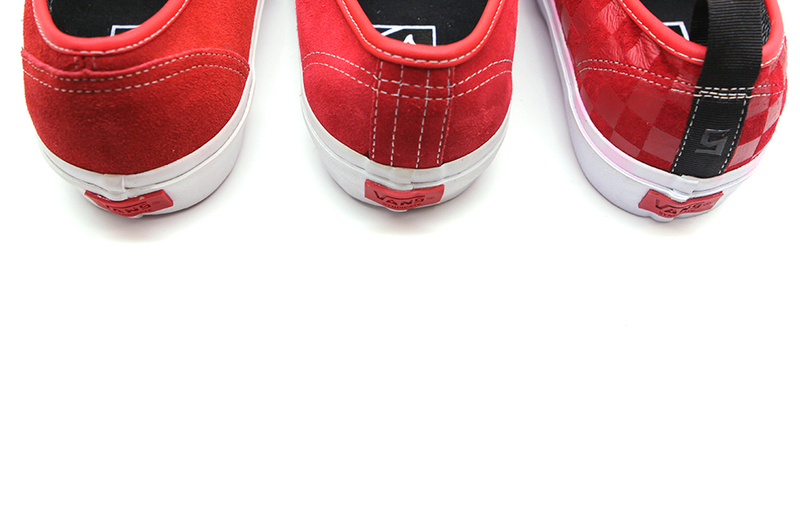 That brings me to the final sample- I added the tonal checkerboard because I think we don't use it enough in the company... checkerboard is such a rad, simple Vans heritage graphic. The heel pull is added because it changes the profile of the shoe, I like how much it disrupts that mellow top line of the collar. And anyone who has even had problems with the binding digging into your heel should be alleviated by the heel pull wrapping over into the lining. I hope that wasn't a huge let down, no obscure references or elaborate backstory, we just wanted to make some sophisticated, skateable Authentics. Were the first samples cow suede? I know the final release is pig….care to elaborate on your preference of suede types? And then to touch back upon the tonal checkerboard that also came in later in sampling? How did that happen? 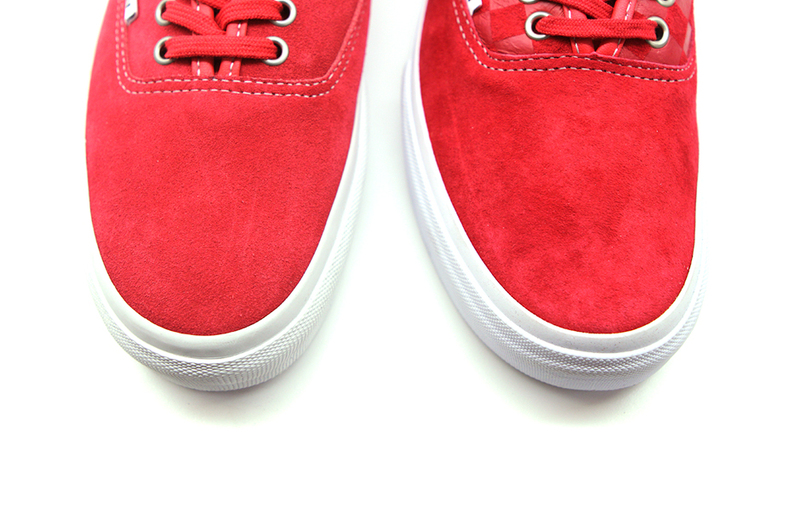 Cow suede was my first thought because its everyones favorite to skate in, but ultimately the pig suede lasts longer, has a better feel, and it takes bright colors much better as you scan see in your photos. 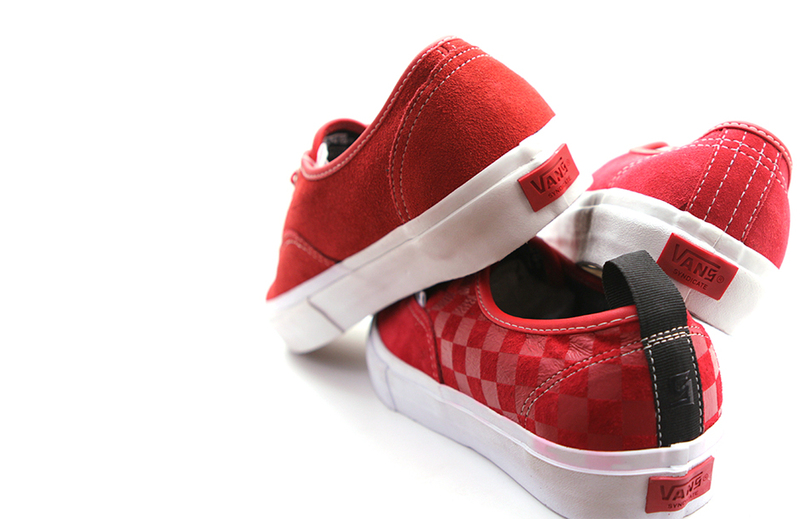 The tonal checkerboard was added to give the shoe a little more interest and to differentiate it from any Classics division Authentics that may appear similar. Although this shoe is a simple Authentic at heart, and fairly mellow at first glance, it has a LOT of technical details that you've elaborated on. Besides the ones we mentioned, there is the great PU ultracush insole, and the DRi-LEX® lining that we have been accustomed to now for a few seasons within Syndicate. The other thing I was excited to see was the Scotchgard™ hangtag attached…. Well the PU footbed is the foundation for our tech details, it's comfortable and it won't pack out or diminish during skating. Beyond that the DRi-LEX® lining is moisture wicking to keep the feet less sweaty, and the pig suede is about as durable as it gets for a natural material, without beefing up the shoe too much. The Scotchgard™ hang tags are included because we spec'ed a WOLVERINE pig suede which includes a Scotchgarded coating from the vendor. The colorways are inspired from the classics that everyone loves...Black, Red, and the classic STV Navy, which, with a white sole, is pretty unbeatable. Are there any last minute tweaks we may see that were not in the final salesman's sample, that we can look forward to? I think these are good to go, they should ship like the final sample you have. Just to wrap it up, I know I've asked you in person about which shoes you are excited about most this spring…..did you mention this one? Do you generally prefer things you've created personally, or do you look toward others designs, or stick with the classics? Most excited to wear? Definitely these tonal checkerboards, like I said up there, STV Navy with a white sole is pretty unbeatable to me. Besides that I'm stoked on how the entire Mike Hill project turned out, though I don't really wear high tops. All the Era Pros from the Skate line we did this season I'm stoked on, I'll have to get my hands on the basic dark navy and off white ones. I don't necessarily prefer things I've created, but it seems every season there is one or two that I've done that I really want to wear. Most of the time I prefer the more understated shoes, simple basics, oh and I also love a good Aloha print. Neal, thank you for your time and insight into your world! Anytime Brant, I'm happy to ramble if you're happy to listen! RED, BLACK and STV NAVY available at Silo, sizes 6.5 -13.0, in store and online upon release.